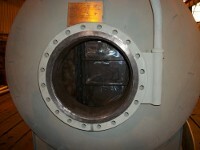 Flange facing may be needed in a numerous number of parts such as these boiler tanks. 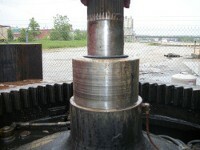 Metal Surgery Milwaukee LTD. has capabilities of flange facing up to 120”. Below are two different boiler tanks which needed flange facing due to imperfections and slight damage to the finish.These parts required a phonographic finish. The picture to the right was a very small face in which we had to give a phonographic finish to. 1 11/16” face being very small, Metal Surgery had to customize an existing machine for the phonographic finish. No problem though for Metal Surgery, because we are very adaptable. This face had many imperfections, some of which was damage. Metal Surgery Milwaukee LTD. made a clean up cut, then the phonographic finish cut. 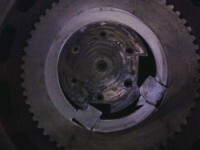 These repairs were made in minimal time allowing the customer to keep his shipping deadline.